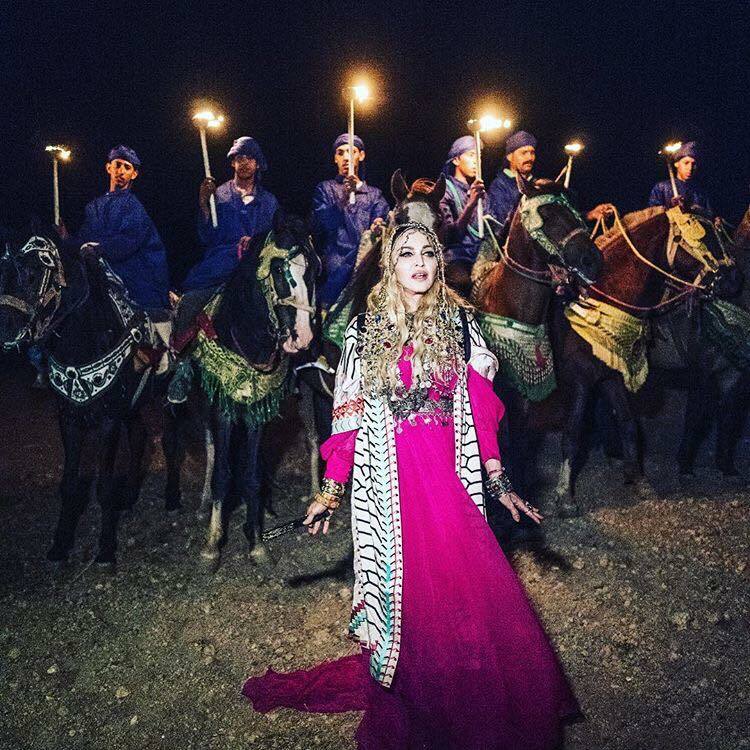 Rabat – After Madonna’s 60th birthday celebrations in Marrakech Thursday, the popstar posted numerous pictures of herself in Amazigh (Berber) dresses at the party. Madonna chose Marrakech’s luxurious Riad El Fenn, owned by Vanessa Branson—sister to the Virgin Group’s Richard Branson, as the location for her birthday party. The private ceremony took place on its terrace, where guests enjoyed a view over Koutoubia Mosque. Yes Bishes Its my Birthday! ???! Thank you to my fans and friends all around the world! ???. #berber #bedouin #marakesh #magic #inspiration #blessed ?? ???? Madonna did not want her fans to miss out on her activities. In the last several days, the singer has shared pictures and videos revealing what she was up to since she landed in Morocco a few days ago. Her fans were able to witness their icon’s walk through the streets of Marrakech’s medina (old city) at the time of the call to prayer and her visit to the souks. Thursday evening and Friday she posted three different pictures of herself wearing a pink Amazigh-style dress and Amazigh jewellery. Madonna did not release an official guest list for her party. Speculations about who and how many invitees she had have been going on for the past days. If looks could kill……….with my ride or die! @debimazar #Marrakesh #morocco #magic #birthday ???? “For my birthday, I can think of no better gift than connecting my global family with this beautiful country and the children who need our help the most,” Madonna wrote. Thank you for all your birthday donations!! ?????. Best Birthday present ever!! #raisingmalawi #homeofhope #metgala #likeaprayer ?? #globalfamily ?